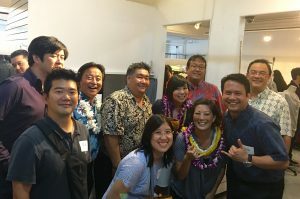 HONOLULU – The High Technology Development Corporation (HTDC), the state of Hawaii agency that promotes and supports innovation and technology business startups, has graduated three more companies from its successful business Incubator Program at the Manoa Innovation Center (MIC). · The Collective, a startup created by Hawaii fashion designers Allison Izu Song and Summer Shiigi that helps independent designers use technology to streamline manufacturing and develop ways to provide high quality, locally produced clothes to consumers. The Collective has helped launch a number of Hawaii designers and has managed DBEDT’s Creative Industries inaugural Creative Lab Fashion Immersive. The Collective recently expanded their operations to Ward Village with retail space. · MeetingSift, a “meeting collaboration platform” that uses technology to bring meeting attendees closer and encourage participation, no matter where they may be in the world. MeetingSift’s products make meetings more efficient, allowing participants to use their smartphones to provide real-time feedback and communication, keep track of minutes, and provide more focus to discussion topics. The company is moving closer to its investors. · Slickage Studios, a Honolulu-based company specializing in creating full-stack software solutions including customized website backend development, web applications, and native mobile apps. Downtown Honolulu is their new home where they will be closer to their clients. HTDC is a state agency, attached to the state Department of Business, Economic Development and Tourism (DBEDT). The agency was established by the Hawaii State Legislature in 1983 to facilitate the development and growth of Hawaii’s commercial high technology industry. The state views high technology as an important driver in the diversification of Hawaii’s economy and one that provides quality, high-paying jobs for Hawaii residents. HTDC launched the 80/80 Initiative to create 80,000 new tech and innovation jobs earning more than $80,000/yr. by 2030.